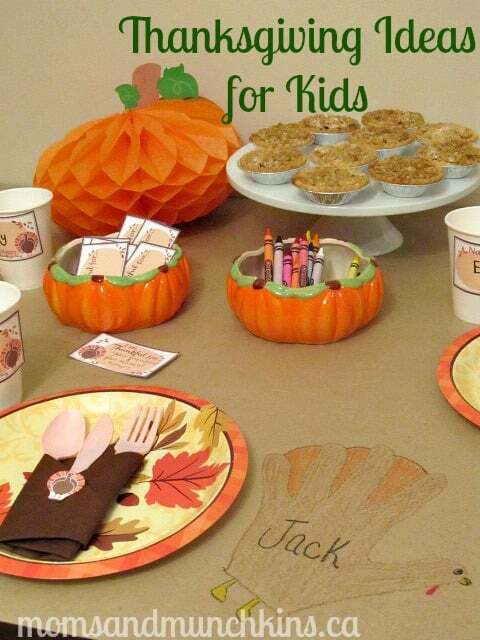 These fun Thanksgiving ideas for kids will help your little ones create the perfect kids table for your Thanksgiving feast. The CreativiDee Workshop has many cute Thanksgiving printables that you can print for free (click here for her freebie section). Mini Thank You Cards: These are perfect for setting on the kids table along with markers. Ask each child to create an “I’m Thankful For…” card for each of the kids sitting at their table. For example, one may say “I’m thankful for weekends when we get to spend more time together”. These are nice keepsakes for all of the kids to take home. Drink Labels: These are perfect for sticking onto paper cups so each child can remember which drink is their own. Coloring Pages: You can have your children color these before the party and then laminate them to use as placemats on the kids table. 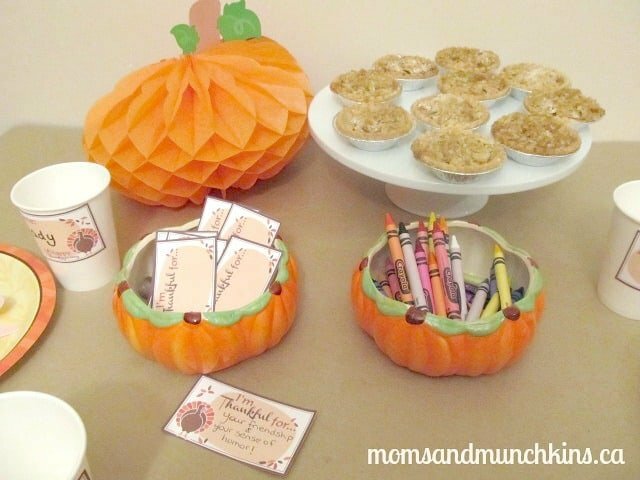 Instead of a fancy tablecloth, cover the table in brown paper and provide the kids with a little pumpkin dish filled with crayons to color with. Have the kids trace their hands on the paper table cloth and create turkey’s out of their hand prints. Each child can write their name on the turkey (a cute & personalized place card). Serve mini apple pies (click here for recipe) on a cake stand. Using CreativiDee’s free printables, cut out some turkey’s from the drink labels and use these tiny turkey cutouts to create fun napkin rings. What are your fun Thanksgiving ideas for kids? Do you have any fun Thanksgiving traditions with your little ones? To stay updated on all the latest ideas for family fun, follow us on Facebook, Twitter, Pinterest and Bloglovin’. Love this!! I’m giving this a try this Thanksgiving for my boys!